Triumph Fitness has been offered at no cost to adult survivors in our community since 2005 thanks to the generosity of hundreds of donors and sponsors. Exercise is one of the most effective things Survivors can do to reduce the chance of recurrence and improve their quality of life. 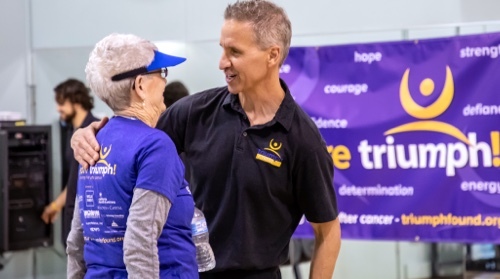 Participants are guided by cancer exercise specialists whose training certification enables them to understand the complex challenges survivors face. 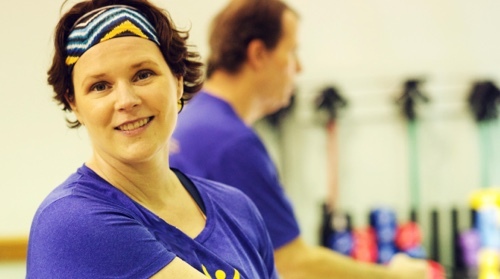 "My Oncology team got me through cancer, but Triumph Fitness restored my life." A cancer diagnosis and subsequent treatment can be devastating both emotionally and physically. The goal of Triumph Fitness is to help cancer survivors take back their lives from cancer while exercising with fellow survivors. Participants are safely and effectively guided by our team of professional instructors, who are all certified in cancer recovery. This 12-week program is specifically designed to assist survivors who have recently completed treatment by regaining strength, stamina and confidence lost during their battles with cancer. It is offered at no cost to eligible survivors in the Sacramento metro area. Have recently completed their treatment. Have a strong personal desire to improve their fitness level. Can commit to a 12-week program, attending classes twice per week. Have received permission from their physicians. An encouraging, safe environment for gaining physical strength and confidence. A program that is gentle and progressive. Triumph is not a “bootcamp”! The chance to meet fellow survivors who are just getting back into fitness after battling cancer. Make new friends with people who really “get it”. A “no judgment zone” at every work-out, where your goals and accomplishments (large and small) are recognized and celebrated! The guidance needed to continue with a fitness regimen that works for you at home or at a gym. Triumph Fitness is offered on a trimester basis: Winter, Spring & Fall. Classes are offered day & evening, depending upon location. Triumph Fitness is offered in the Fair Oaks, Roseville, Pocket & Arden-Arcade area with our gym partners. Classes meet twice a week for 90 minutes each session. You made it through treatment, now Triumph! Triumph Fitness is the first step in the "rebuilding" process. The Program is tailored to individual challenges (such as lymphedema, neuropathy, range of motion issues, balance, extreme fatigue, and loss of muscle mass) while using the group dynamic to build confidence. Participants improve muscle mass, strength, flexibility, & endurance, improving capacity to perform activities of daily living. Reduce the severity of cancer side effects, prevent unwanted weight changes, improve energy levels, and regain self-esteem. Prior to graduation, Triumph instructors work with each participant to create a custom fitness plan to continue exercising on their own. Whether in a gym, or at home, Participants can continue to “Triumph” on their own. Participate in Triumph Fitness or support the program today.